Lina Cao is a young guzheng musician and a member of the Guzheng Society of Chinese Musicians Association. Having learned guzheng since she was 5 years old, in 2008 Lina was accepted to the Nanjing University of the Arts as an “excellent student,” where she studied with Professor Aihua Yan and Associate Professor Jie Ren. From 2011, Lina pursued further studies with Professor Wang Wei from the Shanghai Conservatory of Music, earning a master’s degree there in 2016. 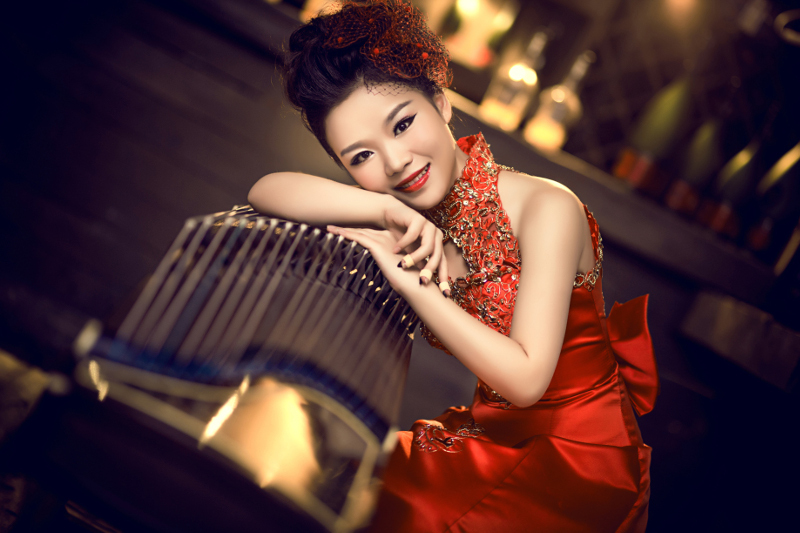 Lina has received popular acclaim throughout China both as a soloist and a chamber musician. She has been invited to multiple artistic exchanges in Germany, France, Belgium, Austria, Japan and Singapore, and had the opportunity to perform for world leaders during important events such as the “World Urban Forum” and the “Fifth EU-China Business Summit.” Invited in 2011 to the Sino-Japanese Friendship Concert, Lina was awarded an international gratitude certificate for “The Cause of World Peace.” In 2015, Lina won praise when she played the Chinese guzheng concerto “Qinhuai Capriccio” with Jiangsu Nationalities Orchestra; the performance was recorded live by The WFMT Radio the Network website from Chicago. As a chamber musician, Lina premiered new works such as Moyu, Yixiangjun, Shungan, and Arirang Partita. Particularly, Lina’s Moyu Guzheng Group was the first guzheng philharmonic society to win two authoritative awards: the highest music award “The Golden Bell Awards” and top prize of Chinese Ministry of Culture “Wenhua Award”. In addition to her work as a performer, Lina has released several papers in Chinese national journals such as “Yunshangsu Perfect Integration of Guzheng Technique and Emotion,” “Analysis of Guzheng Creation and Theory Taking Dark Angel as an Example,” “Music Performance Analysis of Polyphonic Guzheng,” all of which are collected in the China National Knowledge Internet.